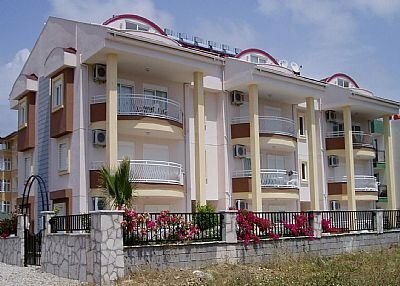 Modern 4 bedroom apartment on a very private complex.With a unique layout & full air conditioning this apartment will comportably support a large family. This is a modern four bedroom apartment benefiting from full air conditioning and a very comfortable layout, having two bedrooms and a bathroom on both floors. This quirky layout-is great for a large family wanting a little more space, two families sharing and wanting their own space, a group of people wanting to holiday together or a small family/couple wanting a little extra space. The apartment is very spacious and benefits from four good sized balconies with the upstairs balconies being enclosed within the roof providing complete privacy. The large kitchen/diner is located on the top floor with the added benefit of private dining on the enclosed balcony. A separate good sized lounge can be found on the lower floor with a TV, DVD player, Satellite system. This leads & opens out onto the largest balcony which over looks the pool and is great to relax any time of the day especially in the evening when the complex and pool are lit. This is a very private complex, with beautiful and well maintained gardens. The complex hosts only nine apartments and so offers a quiet setting to relax & soak up the sun. Although being small, the complex boasts a good sized pool with plenty of space around the outside to position the sun lounges provided. The apartment is located in the Kemer region of Side. Around a two minute walk will take you to a large selection of local shops, bars & restaurants. Only a 20 minute walk or a 5 minute bus ride will find you in the middle of Old Side. Whether it’s a romantic meal for two, a vibrant bar, a shopping trip, a sightseeing walk through the ancient roman ruins, a boat trip out of the harbour and more this beautiful town has something for everyone.